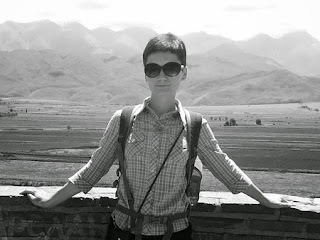 Last week, Lilya, who regularly leads Uzbek Journeys tours in Kyrgyzstan, provided an overview of the ancient Nowruz festival, still celebrated today on 21 March, the spring equinox. In this post, she describes the Nowruz festive table and the culinary subtleties of the Kyrgyz and Kazakh peoples. A discussion of Nowruz specialities would not be complete without first mentioning the Haft Sin table. Following the Persian tradition, some Central Asians, especially Tajiks, follow the Haft Sin festive table tradition. The Haft Sin table includes seven items all starting with the letter sīn (س) in the Persian alphabet. These items are usually: sib (apple), samanu (sprouted wheat) or sabzi (greens or sprouted cereals), sir (garlic), sirké (vinegar), sandjit – wild olive, sumah (spice) and sekké (coin). This is not a strict set of foods, - it may vary. But all items must begin with the letter S. Each item has its own specific meaning, for instance: vinegar is a symbol of patience, garlic – robust health, wild olive – love, apple – beauty, coin – prosperity, etc. 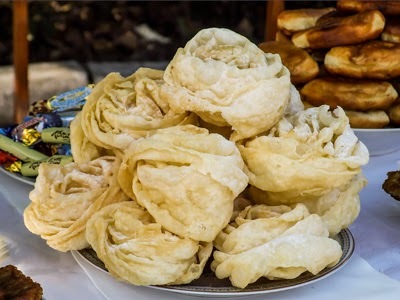 The Kyrgyz and Kazakh cuisines have much in common: meat and flour dishes, and milk-based drinks. This stems from the fact that the Kyrgyz and Kazakhs were nomads for centuries. Beshbarmak which means "five fingers". Nomads did not use cutlery – they ate with their fingers. The essential ingredients of beshbarmak are noodles, meat (either mutton, beef, horse or camel meat – the latter cooked by Kazakhs) and concentrated broth. The broth is served separately, in small bowls. Shorpo – mutton soup with broadtail fat, potato and carrot. Atkan tea - a distinctive type of tea that is widespread in the Issyk-Kul’ province of Kyrgyzstan. It is a strong black tea with milk and salt. Butter can be added also. A few weeks before the holiday, initial preparations are made for one of the crowning pieces of a plentiful table - wheat is sprouted on plates. By 21 March, dazzling green sprouts reach 6-7 centimeters. A plate with sprouted wheat is not only the centrepiece of the festive table, but also a symbol of new life, fertility and good health. 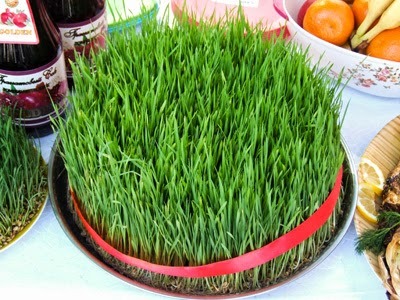 However, the pièce de résistance of the spring festival in all of Central Asia is sümölök (samanu, sumalak, sumanak) – sprouted wheat pudding. This ritual dainty is cooked only once a year, at Nowruz. Sümölök’s basic ingredient is wheat which is sprouted a few days before the celebration. 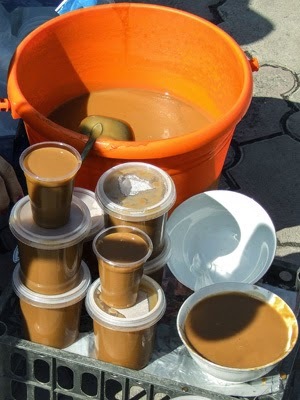 The process of making this specialty is time-consuming: it takes the whole night before Nowruz – 12 -14 hours – during which time the pot must be stirred continuously. It requires much effort and attention. Only women can participate in the process. 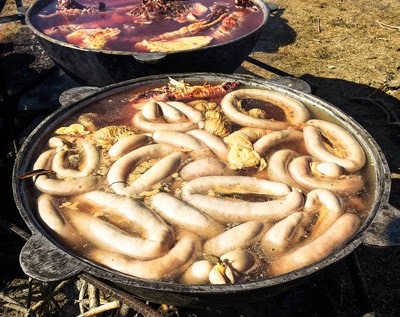 Sümölök is cooked in a large hemispherical cauldron, in the bottom of which 7 pebbles (or walnuts) of equal dimension are placed thus making it non-stick. The sprouts of wheat are minced and then malt is sifted and poured into the cauldron with cotton-seed oil. Wheat flour is also added. Women alternate in stirring the mixture and, while cooking, they invoke God's blessing. Quite often sümölök making is accompanied by chanting. When brewing is finished, the cauldron is covered and the sümölök is left to draw for a couple of hours. The result is a viscous dark brown substance, which tastes like halva. Then it is ladled out and distributed to those who participated in the cooking process and to relatives and friends. Those who get a pebble (or walnut) in a bowl with sümölök are deemed to be lucky, and they can make a wish that will certainly come true. 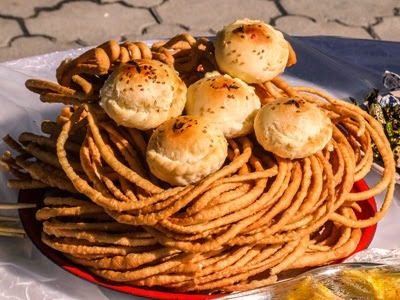 At Nowruz, a must for Kazakhs is a dish known as nauryz köjé. It consists of seven ingredients: water, meat, oil, flour, cereals (rice, wheat, corn), milk and salt. Every cookery specialist has her own signature recipe of nauryz köjé. Nevertheless, this one-of-a-kind soup must be flavoured with a fermented dairy product! Of course there are more festive and traditional nomadic dishes than those described above. Every family adopts a distinctive menu. However, such specialties as sümölök (source of spiritual and physical strengths) and nauryz köjé are always included. At each and every Nowruz celebration we hope that the incoming year will be joyous, bounteous and fortunate for all of us!